INDUSTRY.co.id - Jakarta - Precisely at 00:00 in Dieng, Central Java, PT Geo Dipa Energi, a state-owned enterprise that produces electrical energy from geothermal energy, recorded a production of 763 GWh showing an increase in production by 30 percent compared to the production of electricity in 2016 of 586 GWh. "We are witnessing the recording of the realization of electricity production from both geothermal units in Dieng's office the eve of the new year 2018, and thanked all the company's people who have successfully demonstrated performance in 2017," Riki said as quoted by Antara. Actual production of Patuha Generation Unit for the year 2017 reached an average of 56 MW, while PLTP Unit Dieng managed to improve its performance to an average of 44 MW compared to 2016 which reached an average of 37 MW. The increase of electricity production realization this year is the result of the performance of all Geo Dipa personnel from the optimization program of both fields, both from the upstream and downstream. "The optimization in question is to seek electricity production in order to achieve in accordance with the installed capacity of each generating unit," he said. The new board of directors of PT Geo Dipa Energi (Persero) is fully supported by its shareholders in order to accelerate revenue growth and reduce the accumulated losses of Rp641 billion as of December 2016. While the company increased its revenue in 2017 amounting to Rp740 billion compared to Rp591 billion (five hundred ninety one billion) in 2016, due to the hard work of all managers or Geo Dipa leaders. In 2018, continued Riki, Geo Dipa brings "Improvement Asset Quality through Excellence Maintenance" as the focus of company performance. 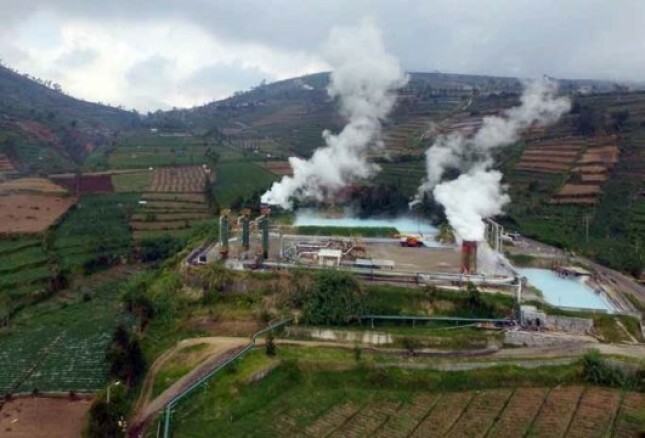 Geo Dipa targets 10 percent growth because Geo Dipa still sees opportunities in geothermal field especially Dieng, because it is still considered not optimal. Geo Dipa will boost the production of PLTP Dieng I and Patuha I as well as optimizing the development of other plants. In addition, GeoDipa will also continue the exploration preparation process with PT Sarana Multi Infrastruktur (PT SMI), Ministry of ESDM (EBTKE), and the Ministry of Finance for Candradimuka Geothermal Prospect, in Dieng Plateau. In addition, GeoDipa is also preparing the preliminary survey preparation process of Geothermal Working Areas (WKP) of the Government Assignment of WKP Candi Umbul Telomoyo and Arjuno Welirng, and updating the feasibility study of Patuha 2.3 and Dieng 2.3 Project covering Well Targetting study and field backup development of Dieng and Patuha Geothermal Fields.